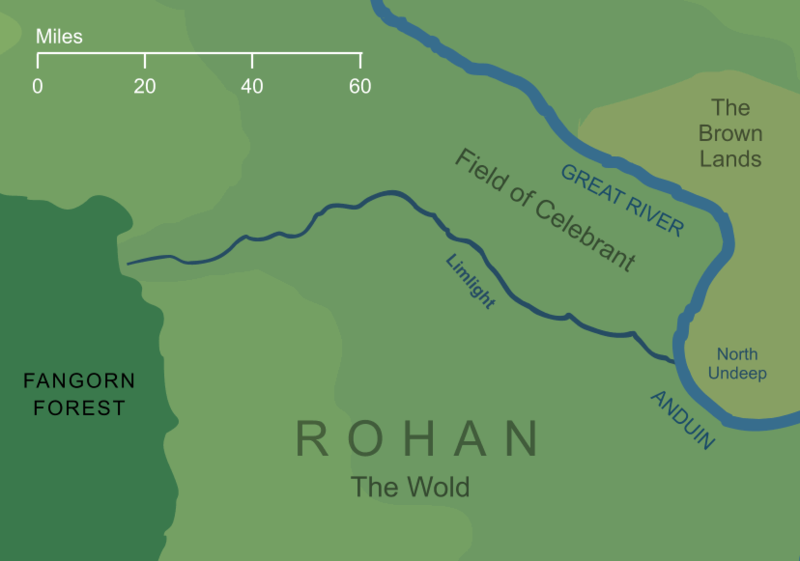 A tributary of the River Anduin that flowed eastward from Fangorn Forest to meet the Great River at the Field of Celebrant. It formed part of the northern boundary of Rohan. It seems clear that the name 'Limlight' was an attempt by the Rohirrim to render the original Elvish name using their own sounds, rather than to translate its meaning. There is a certain measure of confusion over the ultimate derivation of the name, and various intermediate forms exist, but they all contain the element lim- meaning 'swift' (compare Glorfindel's command to his horse above the Ford of Bruinen: noro lim, 'Run swift', in The Fellowship of the Ring I 12). Original content © copyright Mark Fisher 1998, 2001, 2008, 2017. All rights reserved. For conditions of reuse, see the Site FAQ.